Excellent group rates for bookings of 12 or more people. Specially tailored trips for Stags/Hens, Corporate and School groups. Low ratio expert guiding on every trip. We offer dedicated guides and special prices for all of our custom group experiences, get in touch today to organise your private tour. 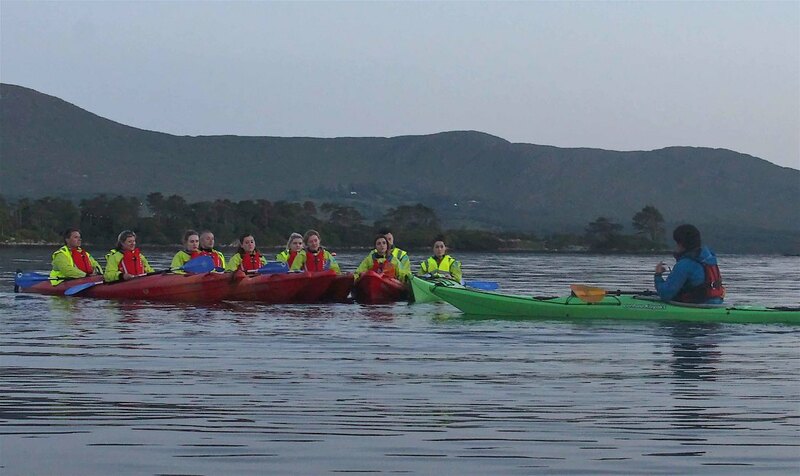 Our unique day and night kayaking trips offer fantastic opportunities for corporate groups. Kenmare Bay is uniquely situated to provide a novel and fun learning experience for students of all ages. The bay offers the opportunity for students to gain an understanding not only of the sea, the true lungs of the earth, but also the surrounding mountains, incredible wildlife and history of the area. Our knowledgable guides will encourage your students to work together as a group in their tandem kayaks. We know that your Stag/Hen party is an exciting and special event; let us make it even more unforgettable! Our specially tailored Stag/Hen tour will take you and your friends on a private journey through one of Irelands most beautiful areas. We have multiple start points available to make travel to and from your hotel as easy as possible. ​Of course, the Stag or Hen goes free! Our discounted group rates also apply to other group bookings; contact us to discuss your trip requirements.